I went over to check out the Asia Society (big mistake--it was too crowded on opening day. I'll go back and look at it another time) on Southmore, and I decided to take a picture of this building which is about a block to the west of the Asia Society's new building. It used to be a house, but it has apparently been converted into a bar that rents itself out for events. I'm very familiar with this house. For two years, my friend John Richardson and I drove out here every week for painting lessons from Stella Sullivan. This would have been roughly 1979 to 1981. Stella Sullivan was born in 1924, studied at Cranbrook, and was a pioneering modernist painter in Houston. And Stella's still around--slowed down a lot, but she often makes it over to William Reaves Fine Art for events. I wish this was still a painter's house. 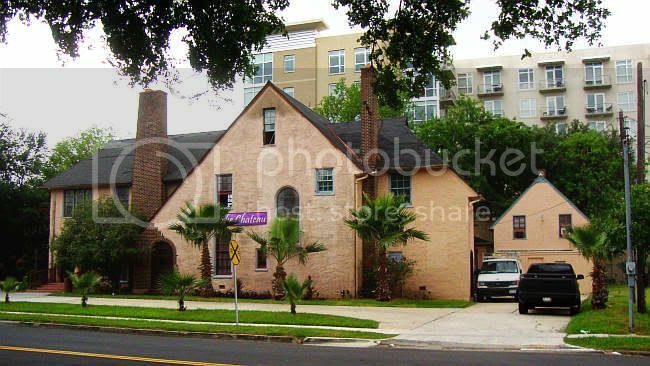 But I'm very glad it hasn't been torn down like so many other older structures in Houston.